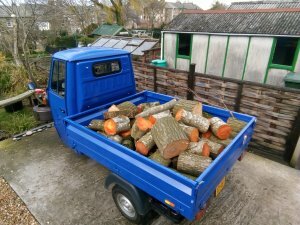 In early 2019 I decided to take the plunge and buy an Ape Classic from Piaggio Commercial in Hull. 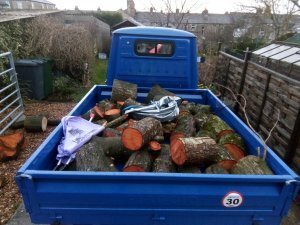 I wanted a vehicle to put to work doing volunteer litter picks in and around Lancaster with my kids, to use as a general workhorse for ferrying catering kit around and to scavenge for firewood: in fact as I write this it is sitting in the yard piled high with logs. 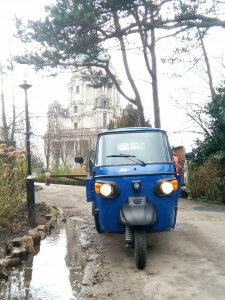 So in January I took a reccy over to Hull to meet the Piaggio / Big Coffee team. Everyone at the Piaggio HQ was super welcoming and super enthusiastic about Apes. Amy, who as office manager keeps the place ticking over, plied me with excellent coffee as you’d expect from a unit that specialises in converting Apes into mobile coffee units. I had a spin in a vehicle and was hooked. A few short weeks later a vehicle had been sourced and registered with a 19 plate. Having watched an awful lot of Rickshaw Run videos on Youtube I was on for driving the vehicle back home from Hull. Although not as exotic a run as traversing India there would be a lot of great scenery crossing the Vale of York, the Dales and finally the Forest of Bowland on the way to Lancaster. The taxi driver who ferried me from Hull station to Piaggio Commercial was possibly even more excited than I was when we started to discuss why I was visiting Hull. He’d recently been on holiday in Gambia and clocked numerous Apes working hard on the African continent. As we pulled into the yard my blue Ape was gleaming out front: no Premiership footballer ever picked up a Ferrari with more of a shine on it. Amy and the boys were very generous with their time when I arrived, instructing me how to drive a vehicle which is part motorbike, part tractor and part van. The tips proved invaluable as I drove home: don’t carry too many revs changing down a gear, don’t look at the handlebar mounted gear shift, just drive by feel. I was encouraged to film the starting procedure in case I didn’t get it first time. Another five star coffee was downed and I was ready for the road. I’ll admit I was a bit nervous and despite being keen to point my new vehicle West I forced myself to drive round and round the industrial estates in north Hull practising gear changes, braking, reversing etc and I’m glad I did. A couple of weeks earlier my father in law had called me to say he was concerned about me driving at slow speeds on main roads across the spine of England. I reassured him by saying I had a cunning plan to follow one of the Sustrans Sea to Sea routes from Bridlington to Morecambe called the Way of the Roses. Being a veteran of a few Sustrans long distance bike rides I was confident the route would be relatively traffic free and beautiful. It was. My first challenge was to navigate a big roundabout and cross a couple of A Roads immediately out the gate. I fluffed some gear changes, nerves can have that effect, but I quickly realised other drivers were generally happy to cut me some slack as I fumbled my way north to link to the Sustrans route as it passed Driffield. The next 30 or so miles were great, long empty largely straight roads with big skies and the Wolds stretching into the distance. I began to relax a bit and enjoyed the curious looks from people and especially kids as I ambled through Huggate, Pocklington, Stamford Bridge then York. Not just York but York at rush hour, awash with people, buses, bikes, cars and commercial vehicles. The slower speeds seemed appropriate to the Ape and the city centre was navigated easily enough. Crossing the A1237 with its huge roundabouts was however trickier, a couple of times I just had to drop the clutch and close my eyes, but the travel gods looked after me. The day ended when my mobile phone ran out of charge and I grew tired of navigating small lanes with my map spread across the handlebars illumined by a torch. I’d intended to camp that night but the Best Western in Boroughbridge looked far too inviting to pass up – in addition to which they had a spare phone charger I could use. I set off bright and early the next morning! I wanted to get a jump on the world and was excited to get into the Dales. Pateley Bridge, Appletreewick and Grassington rolled past the cockpit, sometimes very slowly as the gradients steepened. But that was the point, this small vehicle with its outrageously low fuel consumption spoke to a different time when the world was in less of a hurry. 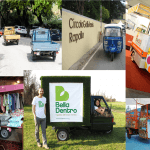 One thing you notice when you drive an Ape is people generally hear you before they see you, I guess it is where the tuk tuk moniker comes from? You get a lot of smiles per mile, both as the driver and from other drivers and pedestrians. In the Dales they are more used to vehicles that sound and look agricultural but even there the vehicle proved eye catching. The weather had been horrendous overnight and many rivers had jumped their banks, particularly around Cracoe and Airton. Watching all those Rickshaw Run videos had given me confidence the Ape would sail through standing water and so it proved. At the end of one 50 metre water splash stood a bunch of cyclists on the Way of the Roses stymied by the huge puddle. I should have acted as a ferry service but and end of day school run back home beckoned. At Settle I decided to take a detour up into the Yorkshire Three Peaks country to get some pictures at the Ribblehead Viaduct. I have never seen the river in Settle so high and water oozed from every drain and hillside. I became adept at getting out of the way of faster vehicles as the roads again steepened and got the shots I wanted of the bridge before pootling through Ingleton, Bentham, Wray and Caton for the final run into Lancaster. I’d averaged about 20mph for the trip, but speed isn’t everything! I arrived home in time to collect my youngest from school and I must admit my Honda felt like a Rolls Royce compared to driving the Ape, but I had been surprisingly comfortable driving cross country. My youngest instantly gave our new family member a name, Daisy Blue. It is the kind of vehicle that definitely needs a name.